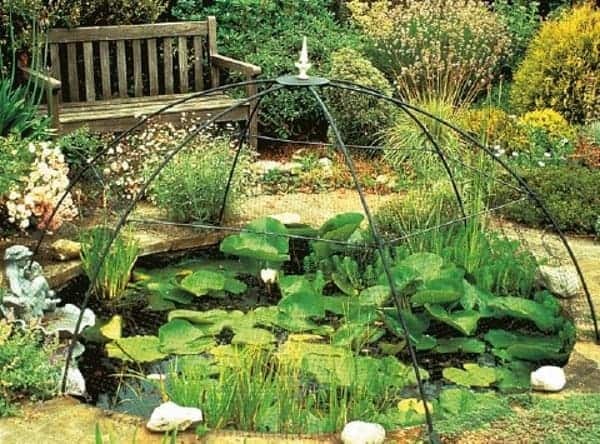 Below are great articles to help you get started learning about the pond care, maintenance, and checks you should be doing with your outdoor pond. 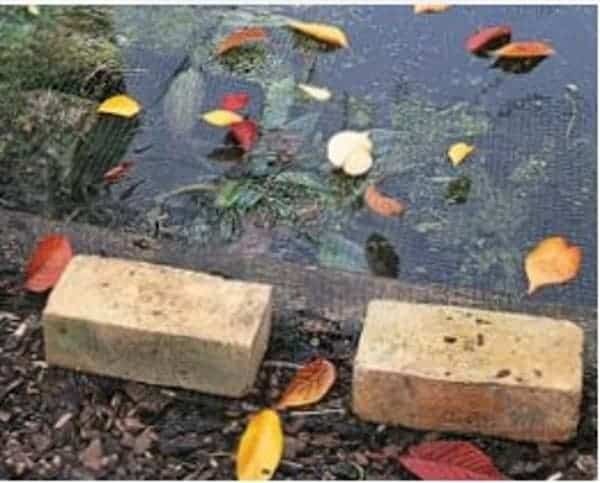 How do you maintain a small pond? Keep your pond cool during the dog days of summer. isestablished, and are typically caused by overfeeding or overstocking. help avoid the major pitfalls. illnesses in their earliest stages . is an attractive addition to any garden, and will provide a healthy habitat for pond fish. Plants around the pond may benefit from a layer of leaf mulch to protect them in winter. must be transferred indoors before the first frost. 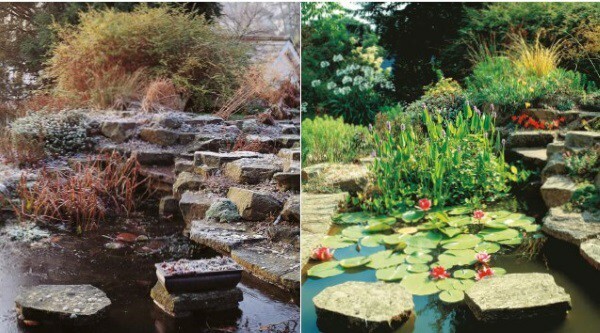 be returned to the pond in spring and will grow quickly over the summer (below right). weather, and such filters may need to be reseeded with bacterial cultures. from the water, may also be beneficial until the filter is fully functioning again. and for any eggs and resulting fry in the pond. the surface of the pond. other plants, or any females have been driven out of the pond by over-energetic males. greater activity levels of the fish result in lower oxygen levels. should be left on overnight, or special aeration equipment should be installed. the pond, because they decompose in the water and can harm the fish. the water, and allows them to be collected easily. for the winter to ensure their survival. not require feeding until spring. Algal blooms—sudden flushes of algal growth—can be a problem in warm weather. will help limit algal proliferation. Blanketweed is a type of filamentous alga, which can trap fish. It should be removed regularly using a stick. 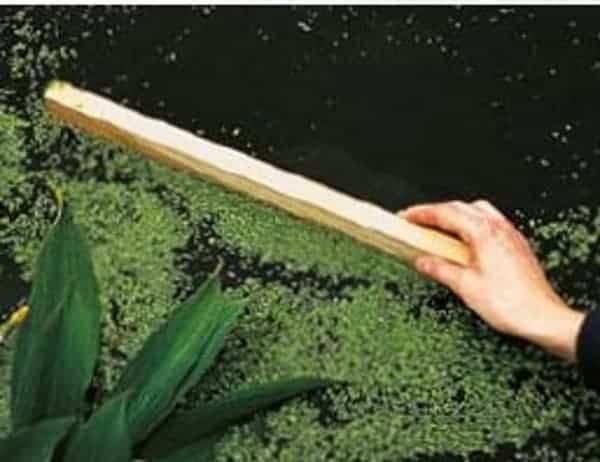 Duckweed grows rapidly, and will entirely cover the surface of a pond. It can easily be controlled by scooping it off the surface. Check to see if fish are showing signs of ill health or behaving strangely. Ensure that the filtration system, if present, is functioning correctly. Note the water level in the pond; sudden falls indicate a leak in the pond liner. Check the ammonia and nitrite levels, especially in a newly established pond. During the growing season, remove faded flowers of marginals, unless seed is required. Test the oxygen levels in the water, especially in hot weather. from the vegetation where necessary. Check the nitrate level of the pond water. It should not rise above 50 mg/l. 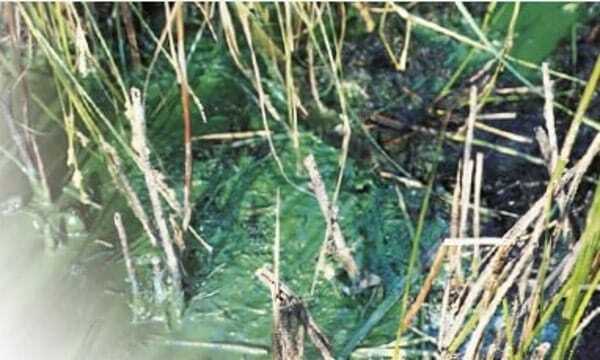 Remove blanketweed so that it cannot choke other plants and pond fish. Prevent any build-up of algae on bridges or decking, which could make them slippery.Remove it by scrubbing the surface of the wood with a clean brush. stepping stones close to and surrounding the pond. 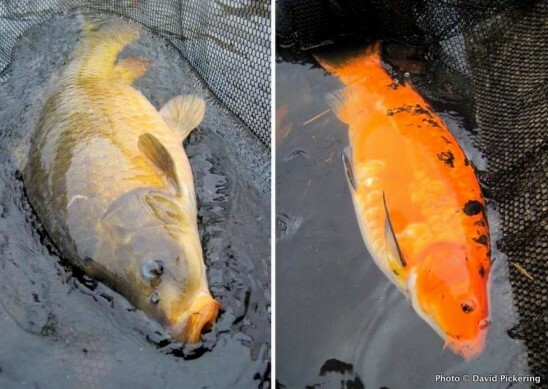 add further fish gradually over the spring and summer months. layers with the warm layer below. of the pond from freezing over in the winter. because the shock waves will traumatize the fish and may even prove fatal. Instead, melt the ice slowly by carefully holding a hot saucepan on the surface of the pond. Decoys are available to deter birds, but they are unlikely to stop raccoons or cats. At intervals of a year or so, it is a good idea to unertake a major clearout. reestablish itself in the warm summer months. If any cases of serious illness have occurred within the pond, it may must disinfection. Some preformed pond units can be lifted out of the ground to make this task easier. 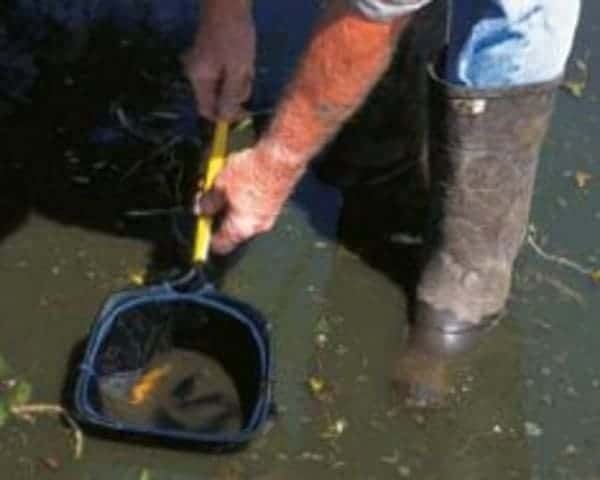 Before starting the clearout, catch the fish and move them to a location where they will be safe. 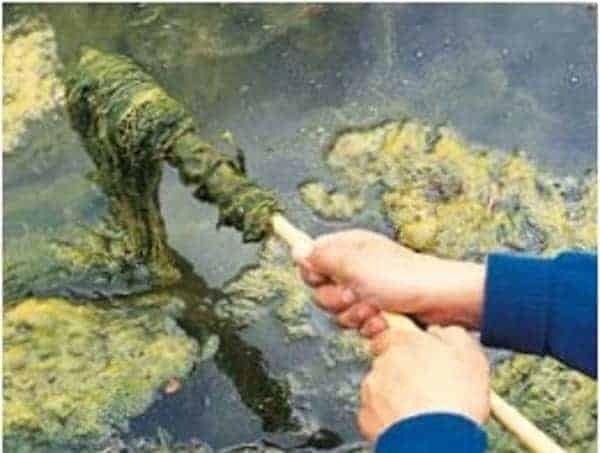 Siphon or bail out the pond water, removing other aquatic life, such as snails or dragonfly larvae. 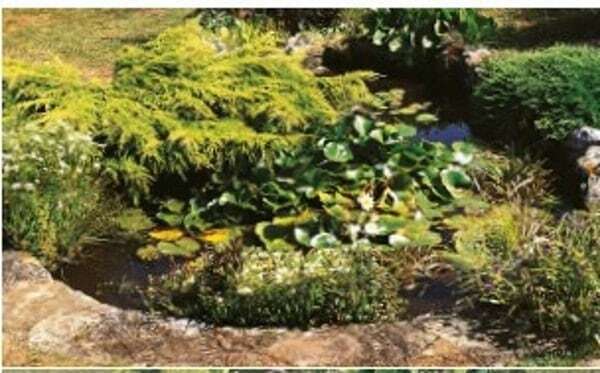 Divide and repot water lilies and marginal plants. 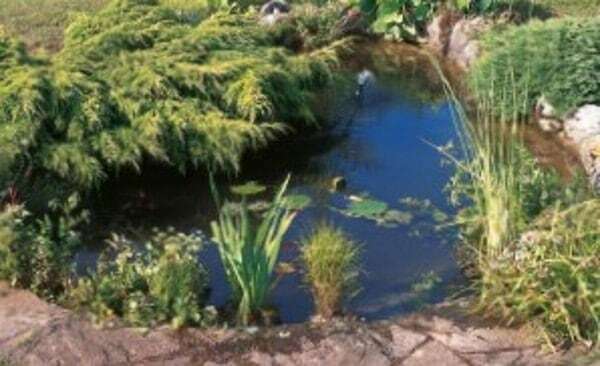 Remove the silt using a spade or scoop, and hose out the base of the pond. The used silt can be dumped on flowerbeds. Refill the pond, adding a suitable volume of water conditioner. 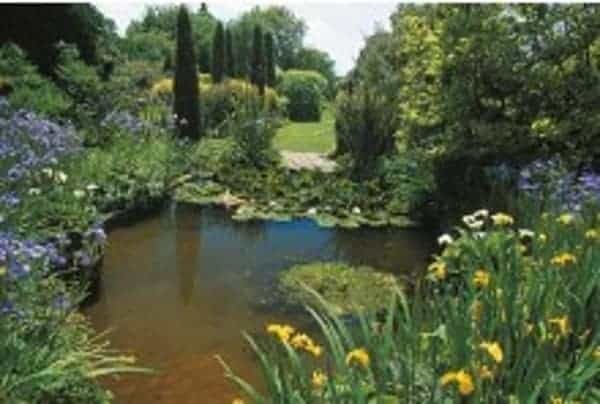 Allow the water temperature to rise before returning the fish and plants to the pond. 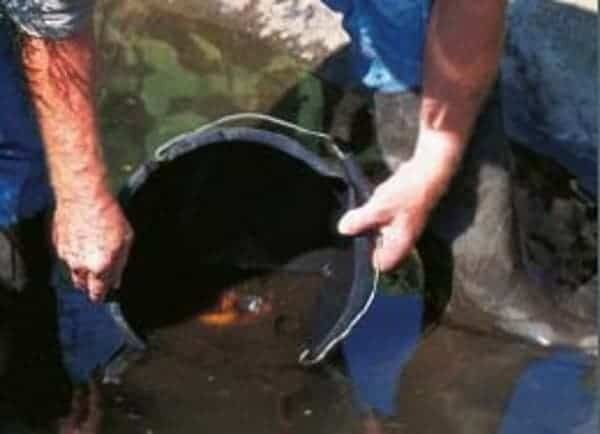 transfer the fish to a safe container. the fish to settle without further disturbance. The surface of a pond can become choked with aquatic vegetation (top). space, and makes the area neater, safer, and more attractive (bottom).